Synonyms: BanG Dream! Special, BanG Dream! : We Had Some Fun! Unaired episode included with the 7th Blu-ray volume of BanG Dream!. Gonna put it short and quick. This special episode made for (depend on perspective) fan service, promotion, and introduction. Fan service : You could see the girls from Popipa(Poppin' party) in their swimsuit, you know beach episode. Promotion : To promote Popipa new single, Hachigatsu no if. Introduction : The new rival band(Roselia) and the members. (Which i think they have better theme and concept than Popipa). Anyway it's an OK special episode with no deep story whatsoever. You could laid back enjoy watching it, oh and if you haven't watch the series go watch it first. It give you some clue of what happened in this special episode. Bandori's OVA, ahahaha. I wanted to see the OVA of it, to be honest, I really didn't expect much of it, after all, it's pretty much just promoting the song "If In August". But they sure as well did way better than I expected. As somebody who started watching the anime because of the addicting tap game I found on the appstore, I truthfully didn't have any expectations for the show, as I thought it would be like any other idol show, and of course it is, but I love it more than the other ones, despite it's cringe beginning. I go suggest you watch the anime first before watching this. Back to the OVA, I was extremely excited to see Roselia in the OVA as I loved them in the game. To be honest, there's not much to the OVA, just a beach episode one can love. Art: eh average as usual, but it's a rather unknown studios, what can you expect? character: cliche characters, but that's what forms the show to be amazing. I RECOMMEND YOU THIS OVA! HUZZA! !...LA gets a speck of hope from this OVA! BanG Dream's OVA is your typical beach episode with an all girl's cast, in which Popping Party goes to the beach due to Saaya not having been there for a while and so they go to the beach with the typical cute girl hijinks. But a subplot comes in in the form of Roselia, another band who's been familiar with them since the anime series in which their leader, Yukina Minato voiced by Aina Aiba has a bit of writer's block for their new song, so they head to the beach to calm their situation and you know where these two plot threads link. This OVA is "ok" for LA for the most part and considering this is a beach episode yes, there is girls in bikini fanservice (it's XEBEC what did you expect? ), but even with that it did LA a solid by actually showing us other band's other than Popping Party and their predicaments as a band (albeit little) and heck even Roselia's interactions with Popping Party members were "interesting" to say the very least, and if your wondering, LA's favourite Roselia member would easily be Ako Udagawa voiced by Megu Sakuragawa. Popping Party were the framework for this OVA, but Roselia stole the show...is the best way to put it. Animation-wise once again animated by the aforementioned Xebec, well even for an OVA, BanG Dream! can't escape the derpy animation and it shows up rather blatantly here as well. The "concert" animation was almost similar to the anime series' quality of using full CGI but it felt that Xebec had improved on this slightly...the key word being "slightly". Voice acting and singing wise, the concert song was an improvement in LA's opinion and a way of saying it's trying to be it's own thing for once (as in, the song felt like it was MEANT to be in this OVA, not just tacked in because it needs to reach a cliche quota) and the majority of the voice work was decent enough and hey Uzuki Shimamura even got a solo singing part! Before LA wraps this review up, LA would probably need to make an addendum to what LA thinks about BanG Dream! franchise as a whole as LA talked about this in LA's BanG Dream! anime series review, LA still thinks it's trying to be desperate and trying to follow a trend to be popular, "cliched" however is different when thinking about the other bands in BanG Dream! (every band EXCEPT Popping Party) and at least it's mobile rhythm game it has up is probably one of the more decent installments in it's franchise. 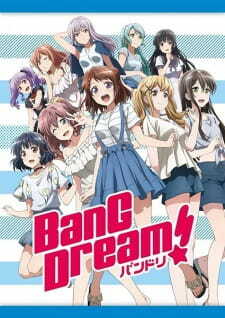 As for this OVA, it was a slight step up from the anime series even for a beach episode and cute girls fanservice moe fluff and clearly shown to LA at least that looking into the other bands other than Popping Party is a more interesting venture to look into for the BanG Dream! franchise. Pitch: While studying and getting bored, the 5 members of Poppin Party decide to take a change of pace, and to go to the sea. There, you will have all the stereotypes: swimsuits, playing in the ocean, beach volley. And coincidentally, the beach holds some kind of concert and asks Poppin to play for them... How convenient. We will get to know Roselia, too, the band who failed the audition in first season. I kind of expect to see them again later on. Totally uninteresting OVA only meant to promote a couple singles Bushiroad tries to force down the throat of easy to fool japaneses. What is even the point? It's not that the music is that bad, but it's a shame it wasn't used to support an actually ambitious and well written series. "Hibike Euphonium", "Sakamichi no Apollon" or "BECK" have great music, very subtle variations in the various recordings, and they actually tell us a very interesting story. "Bang Dream" never tries. Because it's nothing more than a marketing concept. 1) Poppin Party (talk about a lame name...) will never go anywhere. They will probably struggle in a nonsensical way, while promoting a few more singles for Bushiroad, then disband for whatever shallow reason the writters will come up with ("Love Live"?). Don't expect to see them at Budokan after they graduate, or to follow their career step by step. This probably will never happen. 2) The reason that will never happen, is that Bushiroad, to prevent erosion of the marketing concept, will throw at us many spin-off related to different groups with different styles of music and characters. And if they are not spin-off, these groups will probably steal the spotlight from Poppin Party, which would be the perfect excuse to prevent Poppin from getting anywhere and taking more importance than the other "products" Bushiroad hopes to sell. But no problem here, they will all be friends anyway. A good hint for this is that the series do not use the actual name of the band. Art 6: Nothing special here. Well, the CGI during the 2 minutes concert is pretty well done compared to other shows. But that's it. It doesn't beat the full hand drawn stages we had in "Wake Up Girls!" first season. Sound 6: I don't particularly like J-Pop. But the title played here is not too bad. Even though i can't imagine any of the characters coming up with that kind of lyrics. Why do i even speak of J-Pop when it's meant to be a show about rock? Obviously, because "Bang Dream" has always been an idol show in disguise. There is hardly anything rockin' in the series. For good old rock, watch "BECK"
Characters 3: Easy to notice that the characters from Roselia are completely different stereotypes compared to Poppin. I already explained why. None of them are interesting. The original characters of the series do not get better, either. They only serve as a face for the CDs. Enjoyment 2: Boring as hell. Only the 2 minute concert grabbed my attention. That probably means that i'm weak and fell for the stinky marketing method used there. Overall 3: It's watchable. But be aware that what you'll see is filler with advertisement. Side note: forgive my english mistakes if possible, since i'm french, after all.